Wow, already there’s buzz that U.S. Secretary of State Hillary Clinton should run in the Democratic primary, to replace President Barack Obama. Isn’t it a bit soon? (The first state primaries don’t start until January 2012!) I know, she ruled it out in 2010. But the times, they keep on a’changin’. Madam Secretary, if you are reading this — the president is a good man who happened to be very unlucky in office. He inherited problems of almost unprecedented severity. But this is no time for sentiment to cloud your judgment. You need to do what’s right. If not now, when? If not you, who? The nation cries out for leadership. Run, Hillary, Run! OR: you never can tell. I really don’t go around lecturing people on pink, but I imagine that when I learned he had new twin girls, I said something about how the world of pink was optional. Much to my total surprise and delight, he seemed to remember and even acted on what I said! For the gunman (we try to limit the use of his name over here), as for the youth at Utøya interviewed before the massacre, there was no doubt that Gro [Harlem Brundtland] was this year’s main attraction, and she had spoken at Utøya just hours before the massacre. She represents everything Breivik hates about contemporary Norway, and was the reason why Breivik selected this particular day for his attack. In comments on a right-wing blog he calls her not “The Mother of the Land” (as she is frequently called), but “The Murderer of the Land.” It turns out that a traffic accident and the usual roadworks carried out during the Norwegian main summer holidays delayed him so much that he only arrived at Utøya after she had left. That probably saved her life. “It’s just like planning a dinner party”. 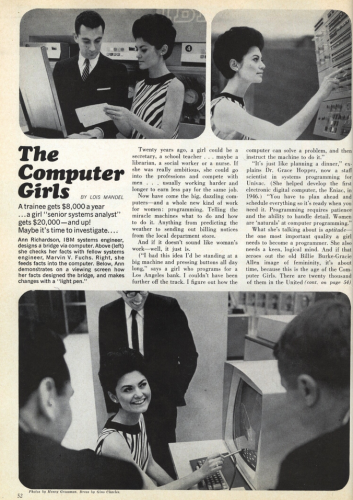 When computers were first introduced, they were thought of as something for women (the secretaries and phone operators) to work with. So folks spent time generating hypotheses about why women would be so naturally well suited to them. More here.